Well if you are here to see my next entry of the Family Food series, I am sorry to say that I decided to break my rule of posting the Snacks/Chaats recipes non-stop until my series ends.After seeing all the beautiful festive cakes and bakes posts for Christmas by our fellow bloggers I was tempted to post few cakes and desserts recipes in my space..I would restart the series soon after a couple of posts,I am sure its fine to break few rules right? 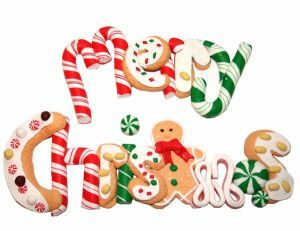 ;)While I have not baked anything for Christmas so far, I did prepare a few for some recent occasions and parties, so why not celebrate Christmas with these recipes. 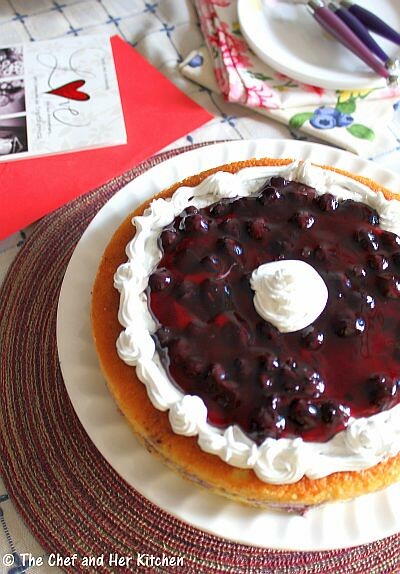 As always I was confused on which type of cake to bake for our anniversary (which was just a couple of weeks back) but hubby dear asked me to bake something using the blueberry tin which he bought during his last business trip. 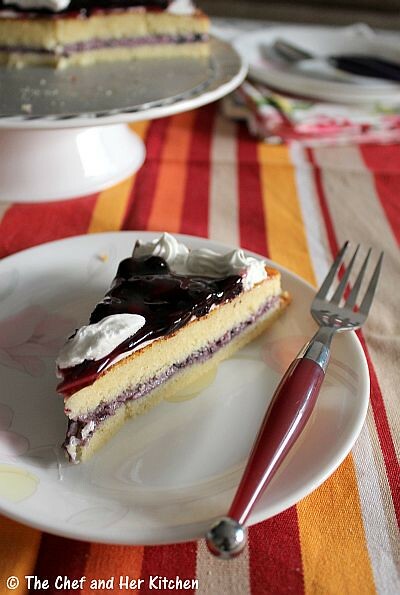 He also wanted me to make a simple tea cake with no icing and all so initially it was very simple for me to select the recipe and I zeroed on this recipe. The confusion though started when I opened the tin and found that it was actually a blueberry pie filling and not whole blueberries.Then I suddenly remembered the Dorie Greenspan recipe which our blogger friend Simran suggested me to try earlier that day. I am yet to get a copy of this book called 'Baking from my home to yours' by this famous writer, hopefully this Christmas Santa would fulfill my wish. Coming to the details of the cake...because of the lack of availability of few ingredients in my pantry at that moment, I made few changes and went ahead with the cake recipe and used blueberry filling to stuff in between the layers and spread some portion on the top using very little whipped cream.To my surprise, though hubby is not fond of layered cakes,he liked this cake very much and didn't refuse even a single time when I served him.I am reproducing the original recipe here mentioning the changes I made under Notes. Preheat the oven at 175 deg C for 10-12 mins.Butter two 9" round tins or and line them with a round baking parchment or wax paper. Sift cake flour with baking powder and salt a couple of times until it is mixed properly. Whisk together egg whites and butter milk/milk until both are incorporated well. In another bowl beat butter and sugar together until it gives a light mixture.Add lemon zest and lemon extract and beat again. Add 1/3 rd of the flour mixture(dry ingredients) and beat again.Add half of the milk-egg mixture and beat well. Add the remaining flour mixture(1/3 rd) and beat well followed by half of the milk-egg mixture and beat well. Add the last of dry ingredients(last 1/3 rd portion) and beat well until everything is incorporated well. Pour the cake mixture into the ready tins until 2/3rds full and bake at 175 deg C for 30-35 mins until the cake is nicely browned and also rise well.Keep an eye after 25 mins and remove it once you feel it is done.Insert a thin knife or toothpick in the middle of the cake,if it comes out clean then the cake is done otherwise you need to bake for long. Rest it for 5 mins on the cooling rack and slowly run the knife around and unmold the cake and remove the paper.Let it cool completely for a couple of hours. Make whipped cream according to the instruction given in the pack or if you are using fresh and ready made proceed further with the recipe. Mix in 1/4 cup of blueberry pie filling mix in 1/2 cup of whipped cream and whisk well.This is one of the most prettiest colors I like,the filling will look so so nice.I used a thin layer of this mixture in between the cake,if you want a thick layer mix in double the quantities and also feel free to add the quantities of filling and whipped cream according to your liking.Just taste the filling for sweetness before spreading it. 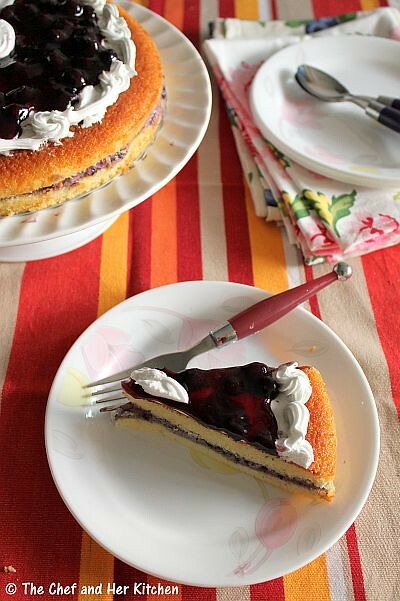 Use a serrated and sharp knife,carefully run it in between the cake to get two equal layers. Spread a layer of the blueberry-whipped cream filling evenly.Spread more quantity to get a thick layer,I did a very thin layer. Place the other half on top and spread a very very thin layer of whipped cream(just to give a even look) on top of it leaving 1 1/2" inches from the sides. 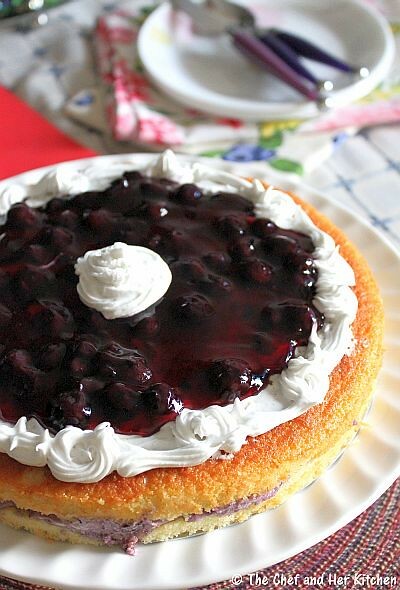 Pour the blueberry mixture evenly on top of whipped cream layer.Pipe the whipped cream on the cake around the filling as per your wish or like how I did it. Cover the cake with a lid and rest this for 3-4 hrs in fridge and while you are about to cut it or serve it take out the cake and keep it aside thirty minutes before. 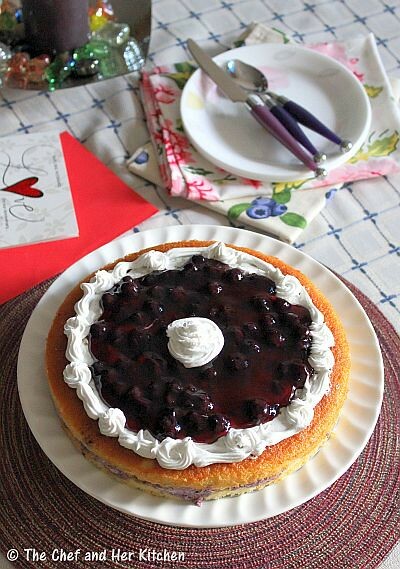 You can substitute blueberry filling with any berry fillings like strawberry or blackberry and decorate according to your wish. I halved the recipe of the original recipe so I got a thin layer of cake.Exactly cut down the ingredients to half.For easy interpretation I am giving you the measurements here 1 cup + 2tbsp Cake flour,2/3 cup butter milk,2 large egg whites,3/4 cup sugar,4 tbsp unsalted butter,1 1/2 tsp baking powder,1/4 tsp salt and 1/2 tsp Vanilla extract. As we don't get cake flour here I substituted it with maida and cornflour.To make one cup of cake flour at home,take one cup of maida and remove 2 tbsp maida from it and fill those 2 tbsp with corn flour.Sift this mixture for 4-5 times until it is mixed well.Your cake flour is ready to use. I did not have lemons at that moment so could not use lemon zest,I skipped it and added our good old vanilla extract instead of lemon extract. Instead of 4 egg whites I used 3 whole eggs.But I suggest you to go ahead with the original recipe. I used salted butter what we get here,so skipped salt as butter already had it.Use it according to the availability at your place. The original recipe mentioned to make butter milk,you need a mix a tsp of vinegar in 1 cup of milk and keep it aside for 10 mins to get butter milk.I have thinned the curds with water to get the required amount of butter milk. I also ground the sugar to powder before using it in the recipe. I know that its quite a lot of changes I made to the original recipe,but it worked well for me.But I suggest you to go ahead with the original recipe as I am again going to bake this soon with the original recipe as I am very eager to bake that perfect Vanilla cake. Wow, I love the filling of the cake very much and not to mention the golden top of the cake. Wow what a cake!!! Happy anniversary dear. I hope you had a blast. 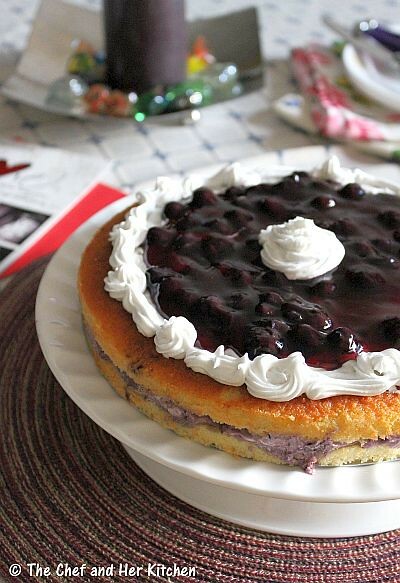 Wow the blueberry filling looks so tempting...wish I just dig in...Merry Christmas. 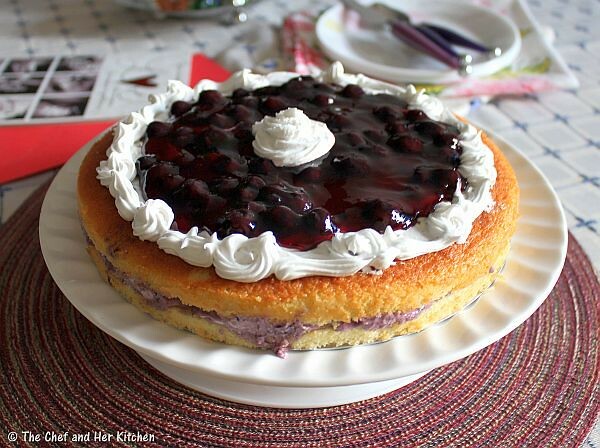 Wow cake looks absolutely divine,especially that blueberry filling gives a fabulous look to this incredible cake. yet another jewel from your chest..seasons greetings. That looks so good! :) The blueberry topping looks so shiny and pretty. Gorgeous cake!!!! Cant take my eyes off them ;) Seasons Greetings..
A different, beautiful cake; it looks wonderful your pictures are superb. Thanks. Happy Christmas and holiday cheer. beautiful cake and well presented.. The filling gave a nice glazy look! Ahh that is the baking spree season! This cake looks delicious. Loved it. The cake looks so gorgeous. Khara Buns | Savory Buns..Iyengar Bakery Style! !